Fiat expects Austin, Texas to be one of its top markets for the Fiat 500. Representing Fiat will be the Nyle Maxwell Auto Group, a family owned dealership Servicing Austin for 16 years. Called Fiat of Austin, the dealership or Fiat studio, will showcase modern Italian looks and design. Maxwell dealerships focus on taking care of the Austin Community and giving a first class buyers experience. As evidence of this, its Fiat Studio will feature a unique delivery experience where the car is delivered on a rotating stage similar to a fashion runway, surrounded by seating for friends and family, and filming the new Fiat 500 owners accepting delivery of their vehicle. 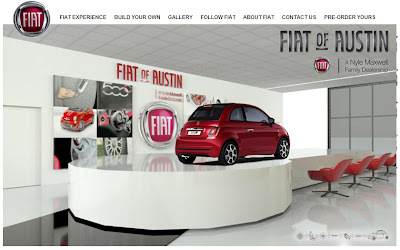 Fiat of Austin just received their 500 demonstrator and is taking appointments for viewing. Their Fiat Studio is expected to open officially on March 1 and will receive a shipment of 60 to 70 Fiats in the next few weeks, 20 have already been sold. Finally, a Fiat 500 in my home state of Texas, but Austin is about 580 miles away. Still waiting for my local dealer to get their demonstrator in El Paso. Northside Fiat in Houston took delivery of their demonstrator a week ago. Their studio isnt open yet but they're running test drive events - the 1st one was today. I'm going next weekend. So....if they are getting 60 to 70 cars in the next few weeks, where is my Prima and since none of my Atlanta dealers seem to have their acts totally together, when am I going to get mine? I'll be slightly miffed if the regular cars get on the roads before the 500 Primas are out there. Mmmmm, El Paso is the closest to me other than Albuquerque...if Albuquerque is too slow, I could get mine from El Paso...when did they say they are getting theirs? I just talked to my local dealer in El Paso. They said their demo model should be in by next week, but their studio won't be completed until the summer, and that's when they will receive cars to sell. I am also in Albuquerque and spoke to a salesperson at Melloy Dodge. They seem to have little to no clue on when the 500's would arrive. I have a lease ending in May and I am not having any confidence a studio will be open for business in time in Albuquerque.